I was joined by Kelly Smith and Ben Nearingburg and three of us left Edmonton Saturday evening, and we all bivyed at the trail-head. There must be stuffs working at night at Lake Louise ski resort, and we could constantly hear the snowmobile sounds. But even that we all got a good sleep. I had done the Skoki approach 3 times, and I knew exactly how boring the initial approach was, so we decided to start in darkness. Your first view would be looking back at Temple, but that’s roughly after 40 min into the trip. So we woke up at 6, and started at 6:40 am. Kelly would be the skier, while Ben would be the snowshoeer, so I had the complete freedom to choose between skiing and snowshoeing. I didn’t want to challenge myself so I kept my snowshoes on. Kelly got a huge pack since he had to carry an extra pair of scrambling boots for the final 500 vertical meters of slog. Mixing skiers and snowshoeers together means all of the group members cannot match speed very well, even if they have the similar fitness level. 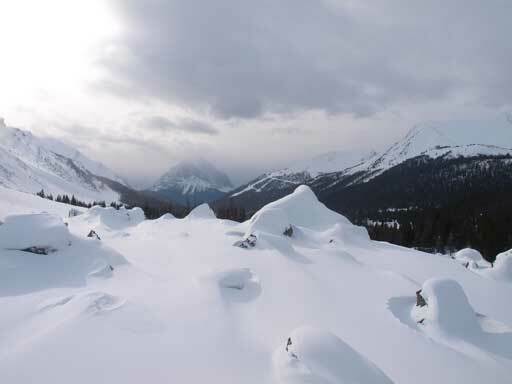 Snowshoeers have slight advantage when going in, while skiers are much faster coming back. The approach to Larch Chairlift took Ben and I less than 50min on our December trip to Unity Peak. It took us 1 hour this time, which is a very impressive pace on skis for Kelly. The sky was getting brighter and weather was cloudy. We kept marching towards Boulder Pass on a well marked trail. 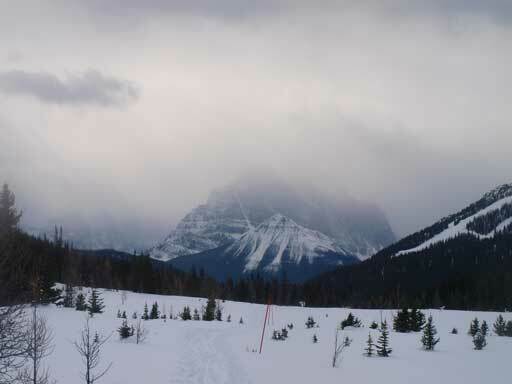 This trail would eventually go all the way to Skoki Lodge. It’s also apparent that this trail got regularly maintained by the snowmobile traffic. 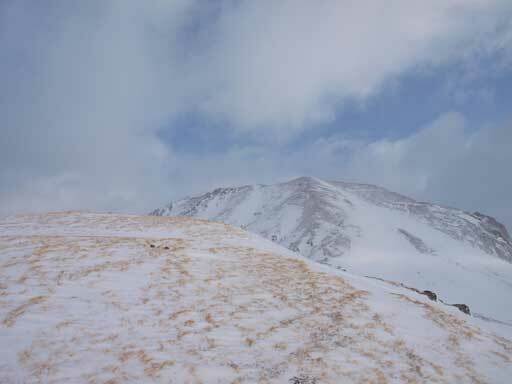 Fossil Mountain is also a peak that can be done even if avalanche condition is high. The approach is as easy as one can expect, and the ridge rarely holds any snow on it. Anyway, we quickly made to Halfway Hut, where Kelly went in for a break. You can always catch the morning light on impressive Mt. Temple if you know where to look back. The slope to Boulder Pass was kinda foreshortened. There’s quite a bit of elevation gain to get there. The other side fully opened up once we topped out on the pass. Ptarmigan Lake was frozen and everything was white. Everything looked to be very different from the classic summer view. 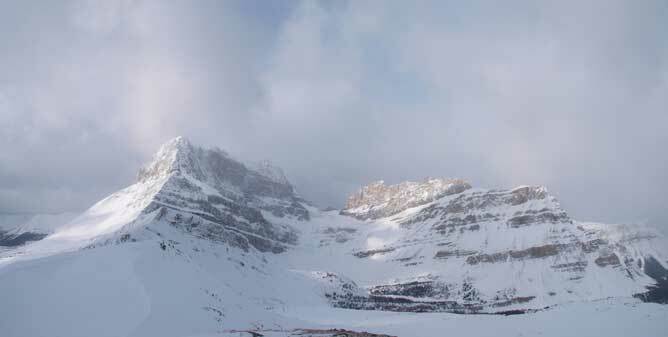 I think one must go in Skoki in different seasons to fully understand its beauty. 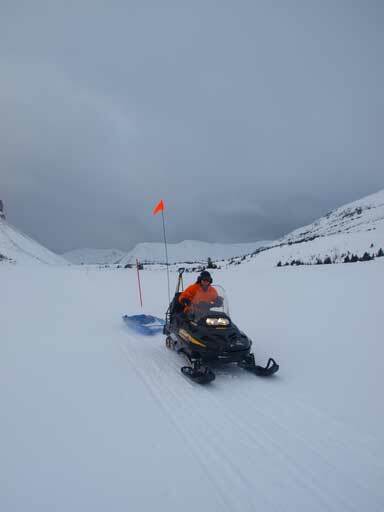 The trail across Ptarmigan Lake was well marked, we we were even passed by a snowmobile. Our objective, Fossil Mountain, appeared to be a true slog from this vantage point. In no time we made to the other side and quickly started gaining elevation towards Deception Pass. There was no avalanche hazard what so ever and we started to go up on our own pace. This was another foreshortened slope. It took us a while to finally topping out on Deception Pass. Wind suddenly picked up. It was blowing fiercely and we were nearly being knocked off balance. Now I started to realize I had left my ski goggles and balaclava at home, because I was using them on Monday. It was below -30 with windchill in Edmonton and I had to dress properly for school… Oh well, there was no way I can turn around at this point. There’s a bump to go over and after that Ben and I ditched our snowshoes. From here on, it was a true slog battling against the gusting wind, for 500 vertical meters on frozen scree. We started to see Heather Ridge and Brachiopod Mountain becoming smaller and smaller, but that was not enough as Fossil Mountain is more than 2900m high. I felt considerably short on energy at this stage due to the fact I had only ate one muffin. 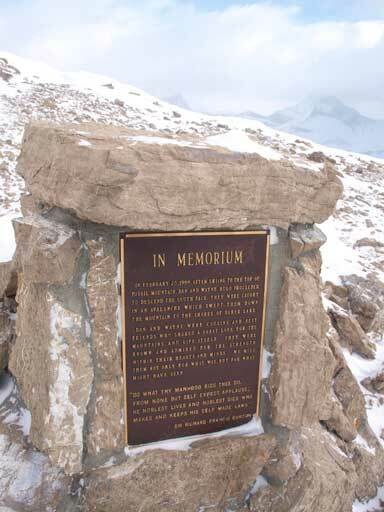 A memorial plaque on the summit. 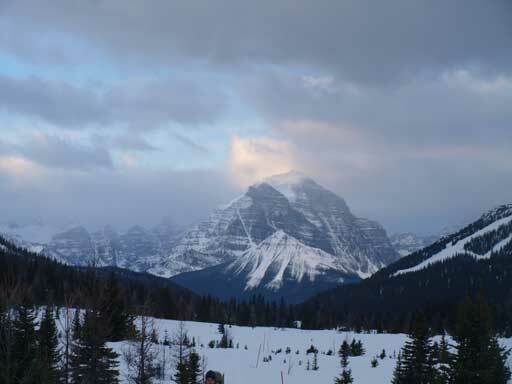 Two guys died on Fossil Mountain in an avalanche. Ben and I didn’t do the summit stay as we couldn’t see if Kelly was going up or not. 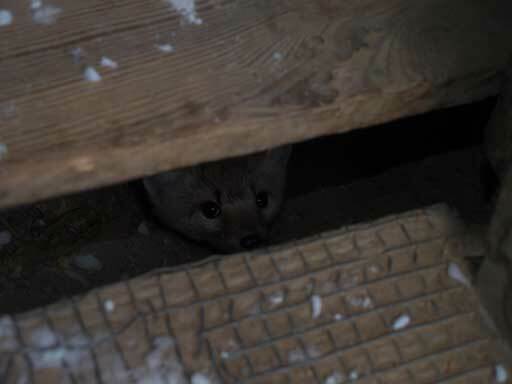 We passed him lower down on the slope. 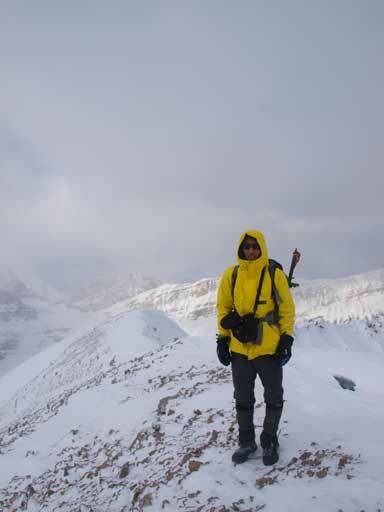 It was a hellish experience to change boots in such wind, but he was still going for the summit. We had a brief discussion whether attempting Heather Ridge or not. Kelly didn’t want to do it, but I was still wishing for a 2-summit day. However, after a bit of thinking I decided to wait for another day. This is not a remote area, and Heather is far from impressive nor difficult. It’s as straightforward as an ideal winter solo objective. It would also give some impressive views when the sky is clear. 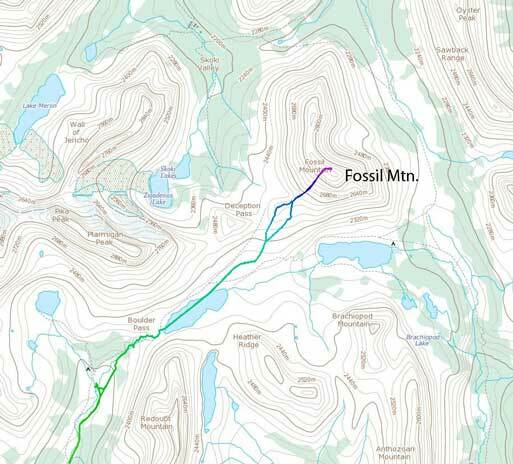 It could also be linked to the Redoubt to Brachiopod traverse to make it a 4-peak day. Ben and I certainly didn’t want to wait for Kelly on Deception Pass due to obvious reasons. Based on my previous experience mixing snowshoeers with skiers, we had to set an agreement of where to re-group. This time we agreed on Halfway Hut. We decided to side-slope around the highpoint to save some unnecessary elevation gain, and as a result we heard a whump sound. We should have picked the safest line, which is to retrace our steps to Deception Pass. Well, the terrain wasn’t steep enough, and we made back to the maintained trail quickly. We passed at least 10 skiers on the slog back across Ptarmigan Lake. Once at the other side, we decided to play around with some big boulders. I climbed up 2 of those. Then we slowly slogged back to Halfway Hut. I think this area is more popular in winter than in summer. I never remember seeing 30 people last time when I came here in September (in perfect weather)… After a long wait, maybe 40-50 min ish, Kelly finally showed up. We were a bit worrying about him, but it all turned out OK.
At Boulder Pass. Lots of boulders to play around. 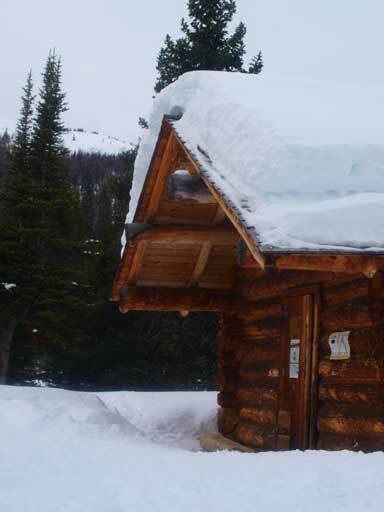 Now it was our turn to speed up, but we knew we could never catch Kelly up because he was on skis… Once we made back to the ski out, we took off snowshoes, and jogged down the Temple Lodge road. It was quite icy though. Our round trip time was 9 hours including all of the stops.